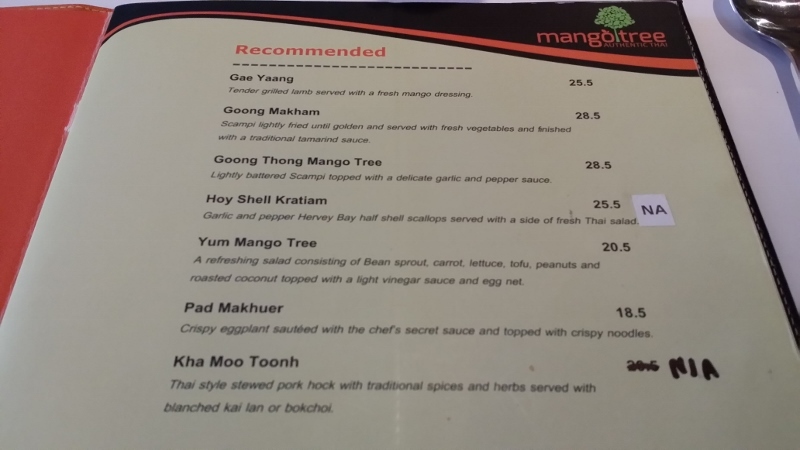 Unusually named, Mango Tree at Port Road specialises in Thai cuisine. The restaurant is quite popular with the locals, so you may want to arrive early to get a seating place. 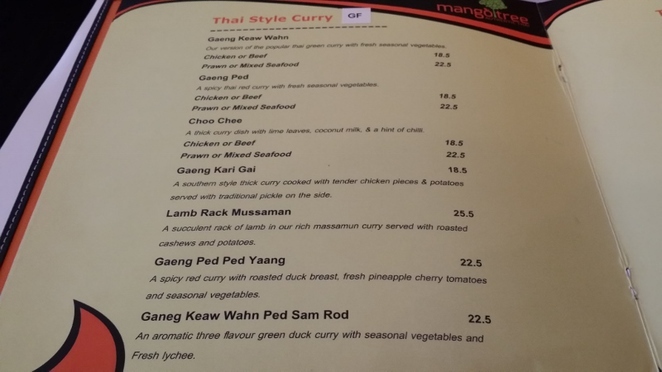 During our visit, we chose to order the Poo Hoe, Gaeng Ped Ped Yaang, Pad Cha stir fry and the Pad Makhuer. 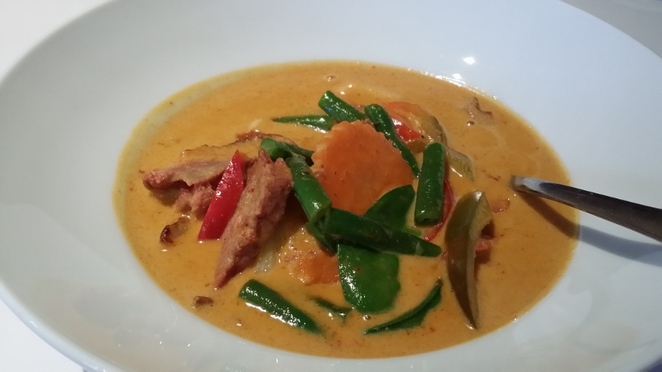 Gaeng Ped Ped Yaang is one of the two duck curries offered at Mango Tree, featuring slices of roasted duck breast in a red curry with pineapple, cherry tomatoes and vegetables. While we would have liked a bit more duck in the curry, the duck was cooked to perfection and the red curry gravy brought out its flavour without being too spicy. The sweet flavours of the pineapple and cherry tomatoes also helped to balance out the flavour of the curry. 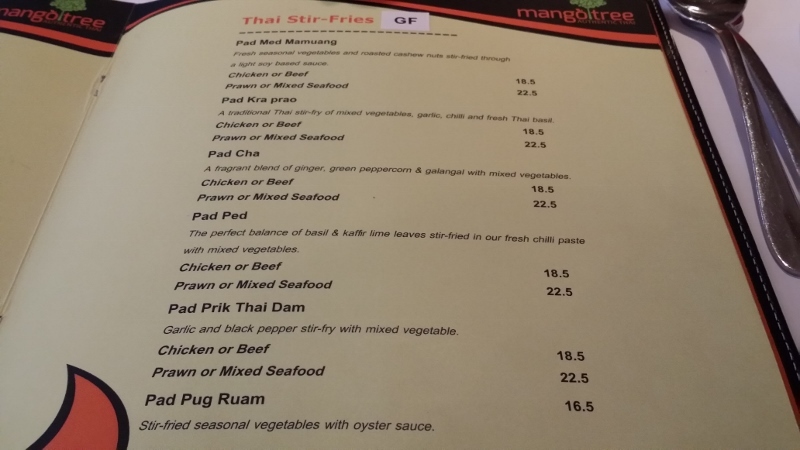 The Pad Cha is one of the stir fries that can be ordered at Mango Tree with your choice of chicken, beef, prawn or mixed seafood. 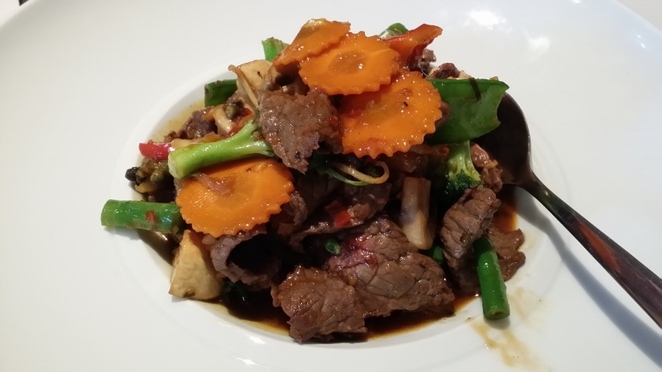 We chose to have Pad Cha stir fry made with beef and it was cooked just right with the vegetables still having a crunch to them. It also had green peppercorns that add a delectable spicy hit to the dish. Pad Makhuer was one of the unique dishes at Mango Tree, consisting of fried chunks of eggplant cooked in the chef's secret sauce topped with crispy noodles. 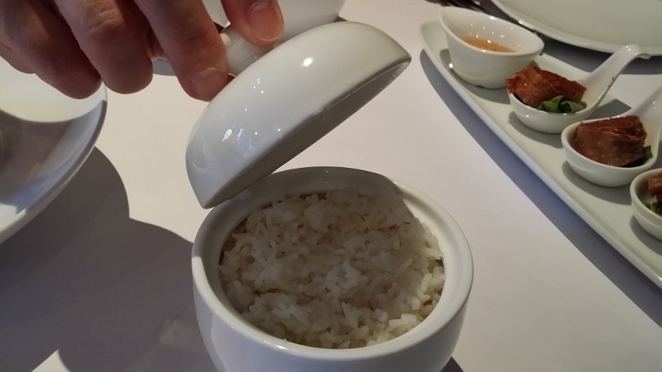 The crispy coating of the eggplant was a good contrast to the softer flesh and the sauce rounded out its flavour, with a hint of what I assume to be hoisin sauce. 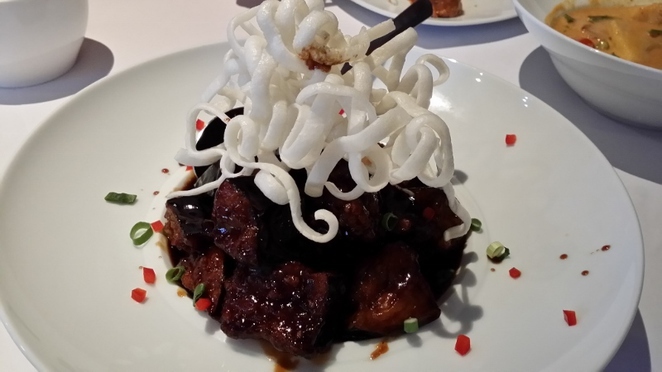 The topping of crispy noodles also added an extra element of texture. 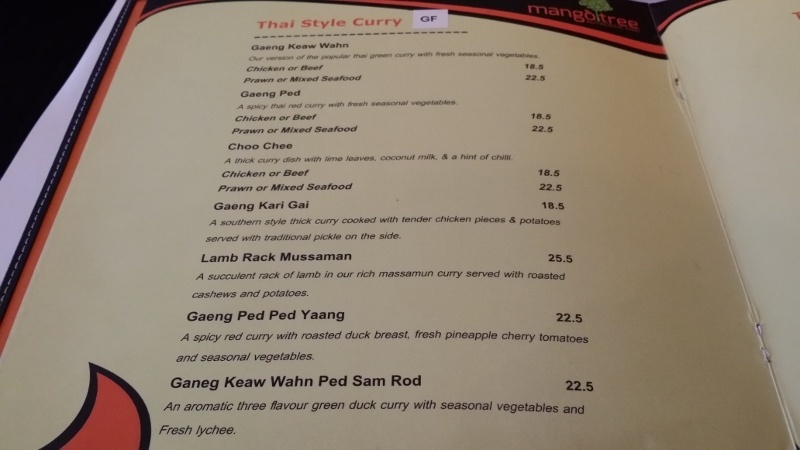 but with a filling of crab meat, chicken and prawn instead of meat. The crispy exterior was a good contrast to the soft filling and the dish came with a sauce to dip the pieces of Poo Hoe in to give it a bit more flavour. 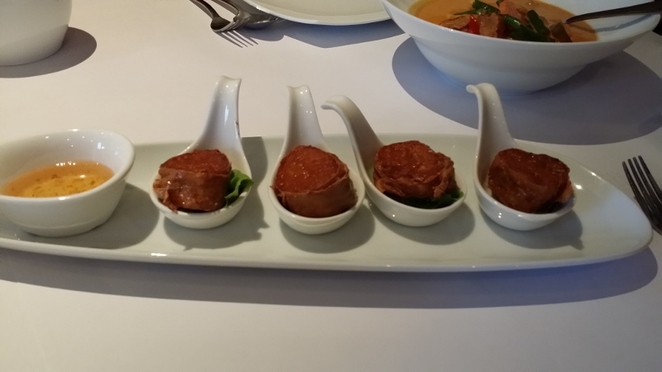 All the dishes were presented very nicely and the ambience of the restaurant was quite good. There is ample parking space behind the restaurant and on the street where it is located.